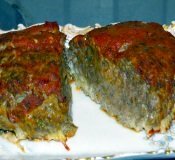 Chris's Italian style meatloaf has been a long standard in cooking for our household and it has evolved to what it is today - a moist flavorful comfort food with an Italian flare. We use ground sirloin but just about any combination of sirloin, pork, and lamb can be substituted. Pork and Lamb mixture is also a wonderful flavor but since Chris and I love sirloin, this is what we use. Whatever you use, this basic Italian style should not disappoint. Chris's Italian style loaf will sure please the family's taste buds, having them asking you to make it again and again. In a large bowl, place ground sirloin and add eggs, bread crumbs, salt and pepper. Mix by hand until all ingredients are blended together. Take mixture and form into a loaf. In a ﻿﻿Pyrex Easy Grab 2 quart casserole with glass cover pour 2 tablespoon of olive oil and coat bottom of dish. Take meat mixture and place into dish. Use a large spoon and press a well along the top of the meat mixture. Pour a mixture of your favorite tomato sauce and ketchup along the top or leave plain. Substitute Italian Panko bread crumbs with plain Panko Bread crumbs. For a meatless loaf, whole foods has a mouth watering recipe. In addition to Chris's Italian style there are a multitude of ways to making a meatloaf. But what type of beef should I use. Without much additional reading, the USDA can give you all the information you may want to determine they type of beef, pork or chicken to use. We of course thoroughly love sirloin so that is what we choose. But did you know there are all different grades? Check it out. Having a good oven makes cooking food so much easier, and when having to put the entire meal in an oven at the same time can be daunting. With this, having a stove with a double oven makes cooking fabulous meals so much easier and while they are quite expensive, you can still get a good price on a double oven stove so shop around. 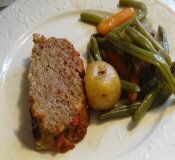 Return to Easy Everyday Cooking Recipes from Chris's Italian Style Meat Loaf.